Some support teams never delete tickets; they instead move them through their workflow to close them using an automation. You can, however, delete a ticket if you want. 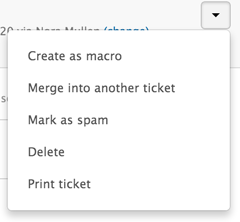 Deleted tickets are moved into a Deleted Tickets view, where you can restore them or permanently delete them. After 30 days deleted tickets are permanently deleted and removed from the Deleted Tickets view. Note: If you want your agents to be able to delete tickets, you must grant them permission. For help, see Enabling agents to delete tickets. If needed, you can delete a ticket. Deleted tickets are moved into a Deleted Tickets view for 30 days, where you can restore them or permanently delete them. You can also delete multiple tickets at the same time. For more information, see Bulk deleting tickets. Open the ticket that you want to delete. Click the Ticket options menu in the upper right, then select Delete. You'll be asked to confirm that you want to delete the ticket. Click OK to confirm that you want to delete the ticket. The ticket is deleted and moved to the Deleted tickets view for 30 days until it is permanently deleted. If you accidentally deleted the ticket, you can click Undo in the message about the ticket deletion or you can restore the deleted ticket from the Deleted Ticket view (see Restoring a deleted ticket). When you delete a ticket, you can quickly undo the deletion and recover the ticket if you need to. Click Undo in the message about the ticket deletion. The message only displays for a few seconds. If you miss the option in the message, you can restore the deleted ticket from the Deleted Ticket view (see Restoring a deleted ticket). Deleted tickets appear in a Deleted Tickets view for 30 days. After that time, they are automatically permanently deleted. If a ticket is in an archived state (greater than 120 days since marked as solved) before being deleted, it will not display in the deleted tickets view. By default, views do not display archived tickets. You can manually permanently delete tickets before that time, if you want. If you do so, the ticket disappears from the Deleted Tickets view, and there is no way to recover the permanently deleted ticket. Reporting overview: Deleted tickets are not excluded from the reporting overview. The ticket ID for a permanently deleted ticket is stored as a record, but no other information or ticket fields is stored for a permanently deleted ticket. Insights: Deleted tickets are excluded from Insights reports. Explore: Deleted tickets are excluded from Explore reports by default. If you want to report about deleted tickets, use a query from the Ticket updates dataset using the Activity > Deletions dataset. Note: One important exception to note here is call recordings for Zendesk Talk. These recordings are not deleted when a ticket is permanently deleted. To configure recording deletion, see Automatically deleting recordings (Talk Advanced). Click the Views icon ( ) in the sidebar, then click Deleted tickets in the Views list. Click the checkboxes beside the tickets you want to permanently delete. The deleted ticket options appear in the upper right. Click the deleted ticket options menu, then select Delete ticket forever. Click Delete ticket forever again to confirm that you want to permanently delete the selected ticket(s). You cannot recover permanently deleted tickets. If you permanently delete a ticket forever, does it still factor into the "New Tickets" count in the reporting/analytics? That depends on which report you're looking at. The Reporting Overview does not filter out deleted tickets from its data set, whereas Insights does exclude deleted tickets. Their inclusion in the Reporting Overview can skew the data on reports available here. Insights reports will always have the most accurate information. "our Development team are already working hard to resolve this, your report really helps us understand the scope of the problem. I will go ahead and mark this ticket as an incident related to the original problem so that you will receive an update once the issue is resolved." Hopefully they have it resolved soon. Thanks for that note Patrick. Thanks for sharing that information, Patrick! If a ticket was backed up and then is permanently deleted, it would still exist in a backup for some amount of time. What is the backup overwrite period, where a permanently deleted ticket is completely gone? Or will there always be a copy in the backups? We work to secure and accurately reflect our Customer data and their accounts. While we do backup accounts in order to adhere to GDPR, we also have a strict Data Deletion Policy which you can view here, https://www.zendesk.com/company/policies-procedures/data-deletion-policy/. While we cannot openly speak to the frequency of our backup process, nor where those host sites are, we can say that our systems actively reflects the current state of your accounts. Deleted tickets are held for 30 days within accounts to allow for recovery. After 30 days they are permanently removed from the account and that is reflected across our system. I hope this helps in part answer your question. Is there an automated way of deleting tickets? We'd like to delete all tickets more than x days old, but going through and bulk updating the tickets is quite a laborious process. Could it be added as an automation for example? There isn't any way to set this up via automation, but we have endpoints in our API that would allow you to delete your tickets in bulk. You can find those endpoints here. In relation to GDPR, it would be very useful for us if we could delete the attachments only. On your informative document about GDPR it says that this can only be done by deleting the whole ticket, however, that is not ideal, as it is important for us to keep track of the previous conversation we had with the customers. Is this something that might be implemented in the near future? Or if not, at least the possibility to delete just the email containing the attachments and not the entire thread? It's possible that this is something product would consider implementing in the future, but it's not something that will be available in v1 of the GDPR compliance functionality. I'm not an API expert, but I believe you can use the API search to pull a list of ticket IDs based on the criteria you specify, and then use the delete tickets endpoint with those ticket IDs. You can find the API search endpoints here! From what I understand we cannot delete tickets based on triggers och automation, this is far from ideal from an GDPR perspective. Are you discussion/working on anything to help us customers with the GDPR process? Will deleting a ticket update the First Reply time (average) - I closed old tickets totally irrelevant made for test but now I have a big number of FRT ! Is it possible to delete a ticket but keep some of the fields for reporting purposes? We have to delete mentions of a user in the comments but the fields have info we'd like to preserve. Thanks! Once a ticket is deleted, all of the data associated with it is gone. I'd recommend checking out the Ticket Redaction App to get rid of those mentions while preserving the integrity of your data. I'd like to make a suggestion if it hasn't been made already. My company is GDPR compliant and we also perform ticket and user deletion upon request from a user in any country. While ensuring our Zendesk Support was compliant with this process, we found the process to be more difficult than needed at this time. We understand this to be a new process for everyone and hope to see vast improvements with Zendesk Support processes for this. I even worked with Zendesk Support and they told me to comment in the forums to ensure our suggestions were seen. They agreed the processes aren't where they could be and there is room for improvement. We ideally wanted to use Permanently Deleting tickets as a method to rid of all PII. (on top of user deleting) However, although a handful of data is still retained, you cannot properly continue reporting on these tickets. We are resorting to the Ticket Redaction App which unfortunately is extremely manual and only works about 50% of the time. If the deletion tool would keep the Tags field when permanently deleting a ticket, we could still know "how many tickets were about GDPR requests in June" or " how many questions we got about messaging last week". Tags are not personally identifiable. Hi, and thanks for the suggestions. I just tested the Ticket Redaction App and it's working well for intra-thread text. As stated in the disclaimer displayed when installing the app, Zendesk Labs is reserved for experimental software applications that are in various stages of development. These Apps may change, break, or disappear at any time. The Apps are meant to be open-source experimental creations that showcase and deliver applications created by our community and our employees. While Zendesk does not officially support the Apps themselves, their respective developers are sometimes able to accommodate feature requests and bug fixes. The appropriate channel for these requests is via a GitHub issue in the application's repository. To create a GitHub issue, navigate to Zendesk Labs and follow the instructions found here. If I delete a users ticket do they know its been deleted? We have a GDPR app in the Marketplace that deletes the tickets but retains metadata including tags. Take a look here: https://www.zendesk.com/apps/support/gdpr-redaction-app/. @Gareth: no the user does not know that the ticket is deleted unless they check their ticket history in the portal, if that feature is turned on. Will deleting a ticket also delete any associated follow up tickets? I understand that permanently deleting a ticket will not remove that ticket number from the ticket count as that sole piece of information will be saved as a record. Is there anything that can be done to reset the ticket counter to the previous value before a spam attack of 3,500 emails (and therefore new tickets)? It's possible to change the starting ticket count in your Ticket Settings, but you can only change it to a number that's higher than the current highest ticket number. So, for example, if your current ticket count is 1000, you would have to start at 1001 or higher. You can't change it back to a lower ticket number. Sorry to be the bearer of bad news! If I delete a ticket, will it be deleted from Insights reporting? Or will it still be accessible in Insights and/or counted in Insights? Per this article, deleted tickets are automatically excluded from Insights reports. Just bear in mind that your numbers won't change immediately...Insights will need to sync again before newly deleted tickets will be reflected in your reporting.